Trumpeter swans are identifiable by the lipstick-like red marking on the lower bill. The best identifier for a tundra swan is a small, yellow, teardrop-shaped spot on its bill near its eye. From a distance I could make out dozens of white birds floating in a slow section on the Snake River. It was not an abnormal sight for late winter, but one thing seemed odd about this raft of water birds. One of the floating birds was quite a bit larger, and instead of slowing paddling like the others it was motionless. I grabbed my spotting scope from the back seat of my truck and zoomed in. Because of the distance and the quality of my scope I first thought it was a rebellious sleeping pelican that refused to fly south, then it popped up its head for a moment. Its short, black beak made it obvious it was not a pelican but a swan. I knew many swans showed up in southern Idaho during the winter and early spring but had never seen one in this particular location and drifting with a large group of seagulls. A hard winter storm had blown through the day before, and like many waterfowl this swan was likely driven from the air and forced to wait out the storm. • Mute swan: Originally a domestic species that was introduced from Europe and can often be seen in the wild. • Tundra swan: A native species fairly widespread in Idaho, with winter and breeding populations in the state. • Trumpeter swan: An Idaho native with a relatively small distribution in southern Idaho, typically during the winter non-breeding months. During the early 20th century trumpeter swans suffered from population declines that make them rarer sightings today. It being winter, it could have been any of the three species, and not being practiced in the finer points of swan identification I could remember only that it had something to do with the beak. I peered through my poor excuse for a spotting scope, and all I could see was that it was black. I could tell by the shape and color that it was not an introduced mute swan, which often has a black knob on top of the orange beak. I finally concluded that it was one of our two native swan species but there was no way I could tell the difference in this situation. Turns out I’m not alone; unless you get a perfect view of the head and beak it is difficult to tell the difference. Tundra swan: By silhouette alone this species is hard to distinguish from the trumpeter swan while on water; however, if spotted on land the tundra swan typically holds its body perpendicular to the ground. Tundra swans also hold their necks fully outstretched during takeoff. The best identifier when in good viewing range is a small, yellow, teardrop-shaped spot on its bill near its eye. Trumpeter swan: This bird is typically larger than the tundra swan — it’s the largest North American waterfowl — but that is not very helpful unless two are standing close together. Trumpeter swans often hold their bodies slightly upright and angled upward from the ground when alert. They will also pull their necks into an S-curve immediately following takeoff. Trumpeter swans are also identifiable by their lipstick-like red marking on the lower bill. 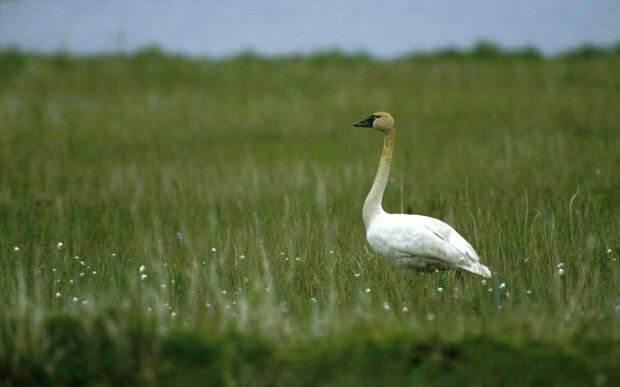 As happens with many related bird species, the tundra swan and trumpeter swan can occasionally interbreed and their characteristics can show up to varying degrees in both species. Idaho, and specifically Hagerman, has also played host in recent years to the rare whooper swan. These swans are normally residents of Eurasia. A sighting in North America is quite rare and is often followed by large groups of enthusiastic birders hoping to get a glimpse of the wayward traveler. 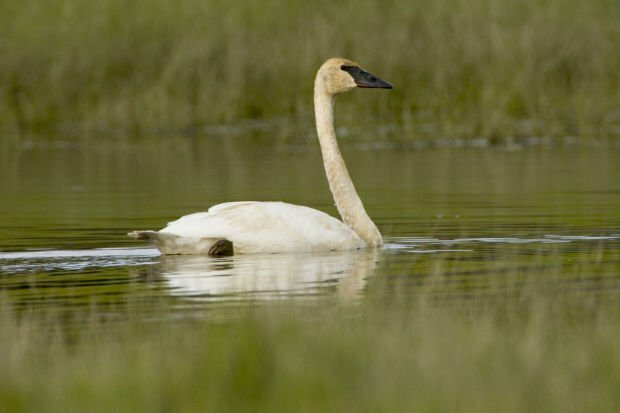 If you are interested in other locations to spot swans or other bird species, visit the Idaho Birding Trail (http://fishandgame.idaho.gov/ifwis/ibt/) for an extensive list of viewing spots. If you are interested in more local opportunities to join other birders or just want to get out and learn more about birds, check out the Prairie Falcon Audubon Society (http://prairiefalconaudubon.org/), which meets regularly this time of year. The Hagerman Bird Festival will be Feb. 14-16, 2014, with speakers, birding field trips, workshops, family activities and a wine and cheese social. Information about the festival: www.facebook.com/HagermanBirdFestival. Ross Winton is an Idaho Department of Fish and Game regional wildlife biologist based in Jerome. Watch for his “On the Wing” column every other Thursday in the Times-News’ Outdoors section. On the Wing: Which Jay Is That Bird? It was an early morning following a day-long, seven-mile hike into a series of alpine lakes. Delores Smith just sent in this comment by email: "Ross, Great start for your column. It is going to be great. Another place to look for the swans is at the back-water area of the upper Salmon Falls dam. You park near the ID Power housing & walk behind the homes. A trumpeter was briefly on Billingsley Ck Park section. The largest I've ever seen. Once hunting got going it departed. Also, I've seen swans No. of Bliss in the corn fields & several near-by reservoirs. You described so well the difficulty of differentiating the Tundra from the Trumpeter."